Below is a selection of the film camera’s I am currently using for the images posted on this blog, the digital one’s can be found here, also a selection of lenses is here. Technically on a “long term loan” from my grandfather, this beautiful piece of kit was manufactured in the early 80’s and still works wonderfully. It takes a small watch type battery and the film advance will not operate unless it has power, something I learnt the hard way by sending off a film to be developed only to find out it had been exposed multiple times in the same place and not on the rest of the roll, Doh! This has an aperture priority mode so it can automatically set the correct aperture before the shutter fires, which sounds fantastic by the way, both the shutter firing and the sound when you advance the roll to the next frame is brilliant, I can think of no more satisfying sound. Anyway I have a 50mm f1.8 lens on this usually, as shown in the picture, but I also have a 70-200 f4 telephoto as well. The camera that just will not die. I bought this for something like £45-50 on ebay, body only as I shoot digital with a Nikon so had lenses that would fit it, and it’s probably the bargain of the century. Manufactured in the mid to late 70’s and as you can probably see from the photo, it’s well used, but it just will not give up. This is fully mechanical, the only electrical part being the light meter which runs off a small battery, meaning should that light meter stop working or the battery die I could just use an off camera meter and continue shooting. The lens is a 28mm f2.8D which I just happened to already own as it seemed like this was the logical home for it. 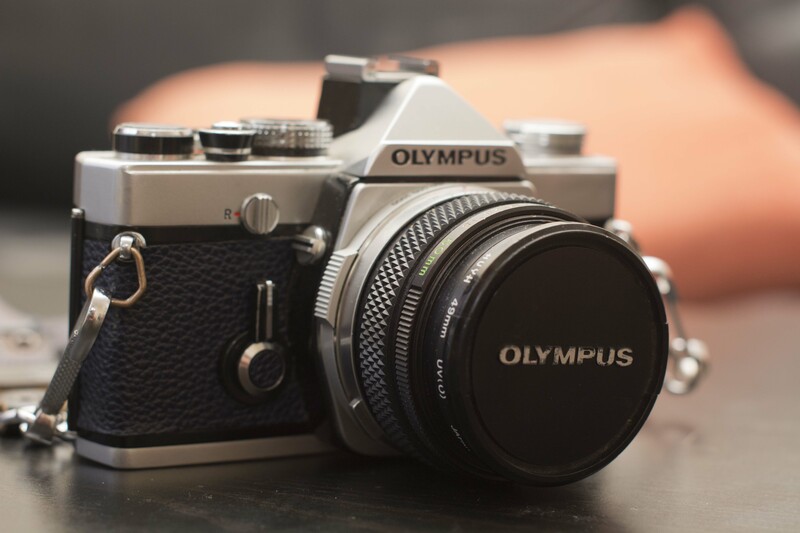 The vast majority of my earlier film photography was taken with this and although it’s been sort of superseded by the Olympus OM-1 it’s still a delight to shoot with. This was a pretty nice example of a camera I have wanted to get my hands on for a while, i shoot with a 50mm 1.8 Auto-s Zuiko lens that I bought separate from the body for around £20, yes that’s right 20 quid for a 50mm lens, bargain and also bought a Vivitar 2.8 28mm as well. Now I say it WAS a nice example as it has since given up the ghost and died on me, never mind as I enjoyed using it so much I’ve splashed out on another example. Besides if I didn’t I’d have two pointless lenses. Thought it was about time for an update to this page since one of the camera’s on here I no longer shoot that much with, and one of them I no longer even own (I miss you Om-1n). 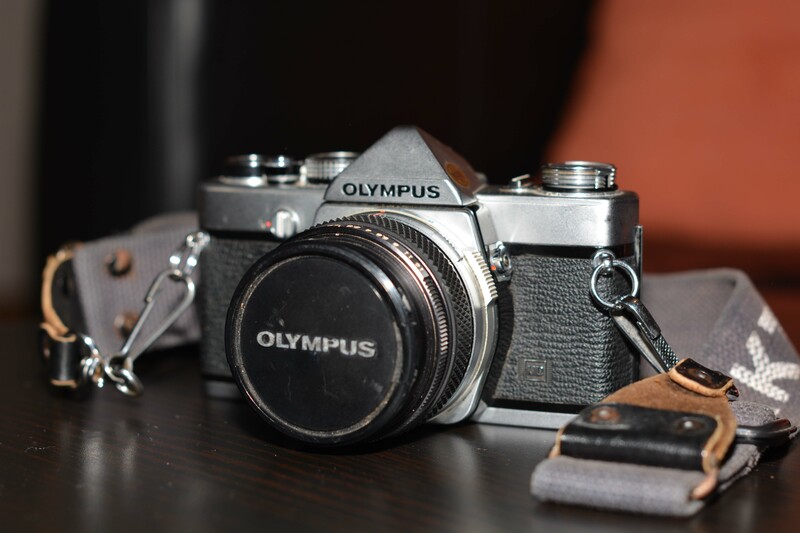 Also because the vast majority of my latest photography has been done with the beautiful little beast above, the Olympus OM-1 I bought to replace the aforementioned. It has become my favourite camera I own, smaller and less weighty than my Nikon FM makes it easier for street photography and also…..just look at the the custom blue leather covering I had made for it, how snazzy is that? I can do nothing but recommend this camera, I love it and I would suggest if you have a chance to use one you take it with both hands, you won’t be disappointed. Another update due to the inclusion of some new equipment to my collection, the first being this lovely example of TLR simplicity. I’ve wanted to try medium format for some time and this came up on ebay for a silly price (as in cheap) so I took the plunge, and I am very pleased with what I got. There’s no light meter so an external or heavy usage of Sunny 16 has to be used, both the viewing and taking lenses are dust/fungus free and wonderfully clear, even the camera’s body is in a great condition. Using this has been an odd experience so far, it’s slow to use which I suppose forces you to think about composing the shot and is the only camera I own where the shutter has to be primed by a small lever before it will fire but the result’s have been, in all honesty, wonderful. A point and shoot but a classic point and shoot no? I’ve wanted to get my hands on one of these for a while and my girlfriend’s dad happened to hand me his old one and said I could have it, no question’s asked. It’s in an almost new condition, it really looks like it’s been barely used so I’ll be putting it through some heavy usage myself. It’s semi automatic in theory although in practice the camera takes control of pretty much everything except focussing, which being a rangefinder is not done ttl. Interesting fact the selenium light meter is solar powered so not only does this not need batteries, technically it can keep going forever, or at least until the sun goes supernova. So I took the plunge and did what I think most photographer’s want to do in their life, I bought a Leica. It wasn’t cheap, but it also wasn’t that expensive for a Leica and certainly not one in this condition. Probably because the lens it came with was a Russian made Jupiter 50mm rather than any German made glass, but other than that it’s a superb looking thing. Going to be putting this through it’s paces soon enough. 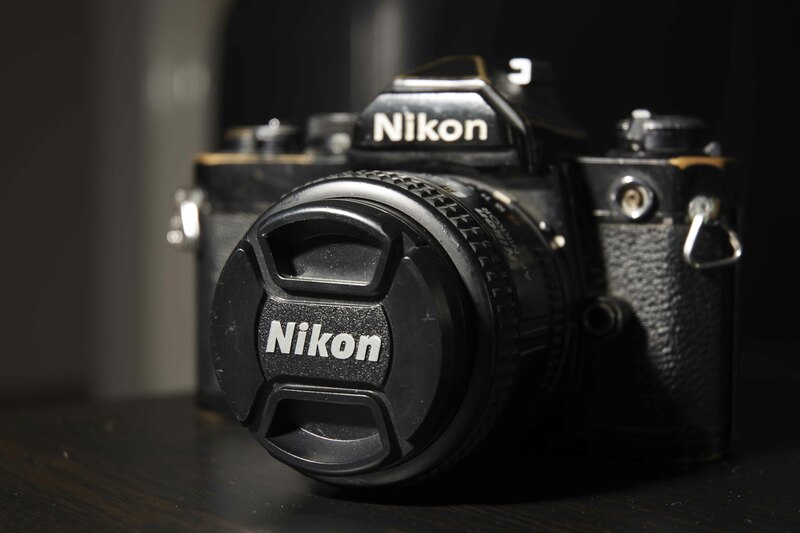 Nice patina on that Nikon. The FM is a good, dependable machine. You are making fine photographs with yours! A great little family there. 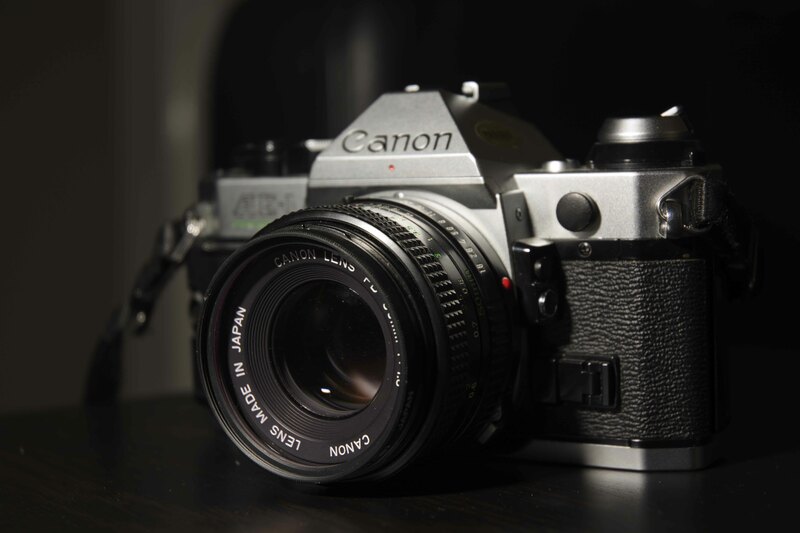 The Canon AE-1 is a classic among classics – I’ve been tempted myself. It’s a really nice piece of kit, satisfying film advance noise and comfortable in the hands….plus if you want to be lazy it’s aperture priority mode is pretty good. Sounds great. Hmmm, if I’m not careful I could become the mad cat lady of the photographic world – loads of them around the house! Well the one’s here are just the one’s I own that work, got a Zenit E and Ricoh KR-5 that don’t…..and worrying plans to purchase more. It can definitely become an obsession. I have a Zenit 3 but I’m a little scared of it. There’s nothing wrong with a drawful of these beauties. Hi thanks for stopping by, when I went to Italy earlier this year I took the OM-1 and my OMD EM5 so I could have a mix of film and digital and it was a great combination.